During WWII concentration camp prisoners were increasingly used for forced labour especially in armament production. Subcamps like Laura became an important factor in the armament industry. When the camps were first established, SS was anxious to pool as many detainees as possible in one place. With the rise of Allied air raids on Germany at the end of 1942, camp inmates were increasingly used in construction brigades in the bombed cities as well as in armament factories and in moving war plants to underground facilities. Subcamps had to be established, to accommodate the prisoners nearer to their operating sites. Concentration camps transformed from sheer tools of terror, intimidation and destruction to an increasingly important factor in the arms industry. Most inmates of the subcamps were foreigners, Laura was no exception. With the expansion of subcamps all over the Reich and the occupied territories (hundreds of camps were established), the appearance of detainees became a conspicuous aspect of German society. The concentration camp in Buchenwald on the Ettersberg near Weimar was established in 1937. In the beginning it had only few subcamps. With the expansion of the camp system in spring and fall 1943, Buchenwald became a base through which all detainees were channelled. Soon, more than half of Buchenwald’s prisoners were placed in subcamps. Detainees in the subcamps had only few chances to survive. During the first three months of 1944 as many detainees died as in the years 1937 to 1940 combined. Two thirds of these died in Mittelbau-Dora, several hundreds in Laura. With the evacuation of concentration camps in Poland and the exploitation of an increasing number of slave workers, another wave of establishing subcamps started in summer 1944. Between July and December 1944 a total of 76 new camps were founded. The largest subcamp, Dora, became an autonomous camp in 1944 including all its smaller subcamps. In February/March 1945 the Buchenwald subcamp system reached its largest expansion with 89 camps for women and men. 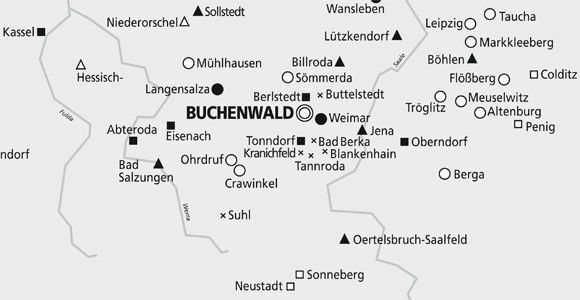 During its entire existence Buchenwald had 136 subcamps under its administration. With the advance of the Allies the subcamps were evacuated in spring 1945. Inmates were sent on death marches involving heavy losses.